Your unused bed skirts can be put to use in your craft projects. This is a guide about craft uses for bed skirts. Ever buy a bed-in-a-bag and not need the skirt? Well, I came up with some perfect uses for it. I took the skirt length wise and made a slip 1 1/4 inch to fit the rod. Check your rod for measurements. The hem is already done for you. 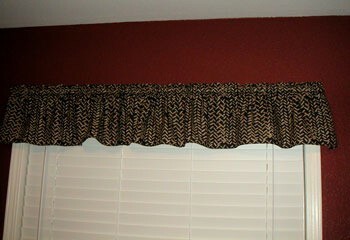 Simple Valance topper. 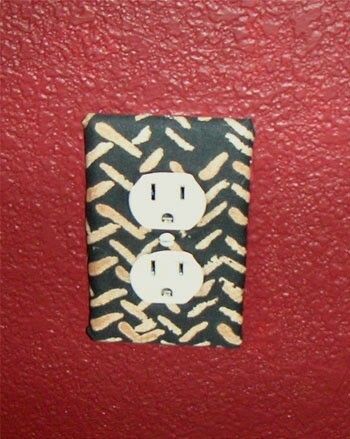 Then I took the switch and five outlets and cut about an inch in material longer both length/width wise of each plate. I hot glued the material to the plate. 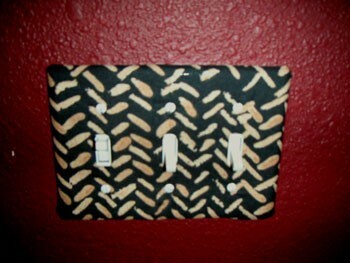 What's nice about hot glue is it can be taken off quite easily for changing decor look. Take some small scissors to cut out material for switches and plug-ins. Hot glue or tape to the back side. You can also cover picture frames or make small pillows for the bed. Most Bed-in-bags come with shams. I still have a lot of extra material to do something else if I desire. A fun coordinating way to use the skirt. I have found a great bargain for all of us crafters! If any of you are thrift store addicts like me, you may have noticed that there are a lot of bed skirts in the linen section of Goodwills, etc. Apparently not a lot of people use them, but they are a great source of fabric. You can cut the ruffle apart from the center and you have yards of material to use to make a skirt for an ottoman or chair, valances, or even a border for a quilt or comforter or pillows. You can usually pick one up for a buck or 2! What a deal! Question: Uses For King Sized Bed Skirts? 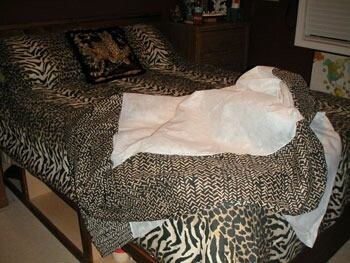 Thanks to everyone for your great tips regarding pillow shams. Does anyone have any ideas for uses for my king sized bed skirts. The base is white and the ruffles are in various patterns. I would appreciate any ideas on this. My thanks in advance. You guys are great! I put this on your other one about shams but am reposting it here. RE: Anyone have uses for pillow shams? The decorative sides of the bedskirt could be cut and made into pillow covers. How about making valances with them? This may not work for your situation (ruffles), but a tip that was given to me was that bedskirts (any size) are an excellent source of material for quilting. You can cut them up into either squares or strips and piece them together to make quilts/comforters. I've found that bedskirts are put into the free pile at yard sales or marked very cheap at yard sales or thrift stores. I haven't put one together yet ... but I have been stockpiling the "materials".